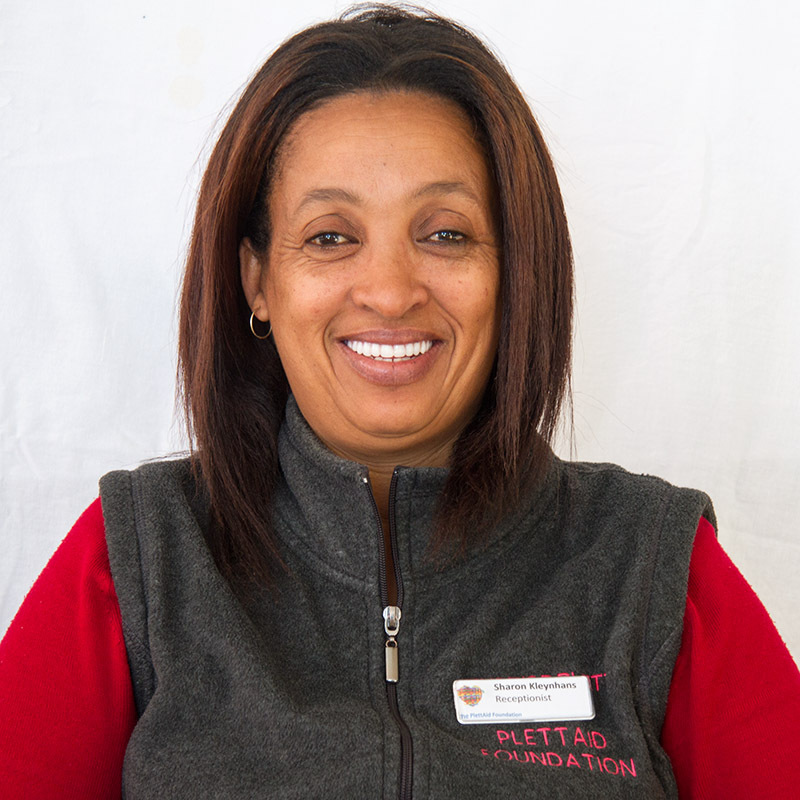 Meet the friendly faces and hard-working team behind the PlettAid Foundation. Cecily is a professional nurse with extensive knowledge in both Health Care and Leadership. She graduated from Stellenbosch University with a degree in Nursing, worked in primary health care for 15 years before starting with Hospice. She has mentored and coached clinical teams in palliative assessment, care planning and holistic care. Cecily was contracted by the Hospice Palliative Care Association of SA to offer assistance, mentoring and coaching in the following aspects of an organisation: governance and leadership, human resource management, risk management and quality control, monitoring and evaluation, holistic patient care. She was contracted by Ukuphela Training, a Health and Welfare SETA accredited training provider as a facilitator and assessor for various courses. Cecily is CEO of The PlettAid Foundation. 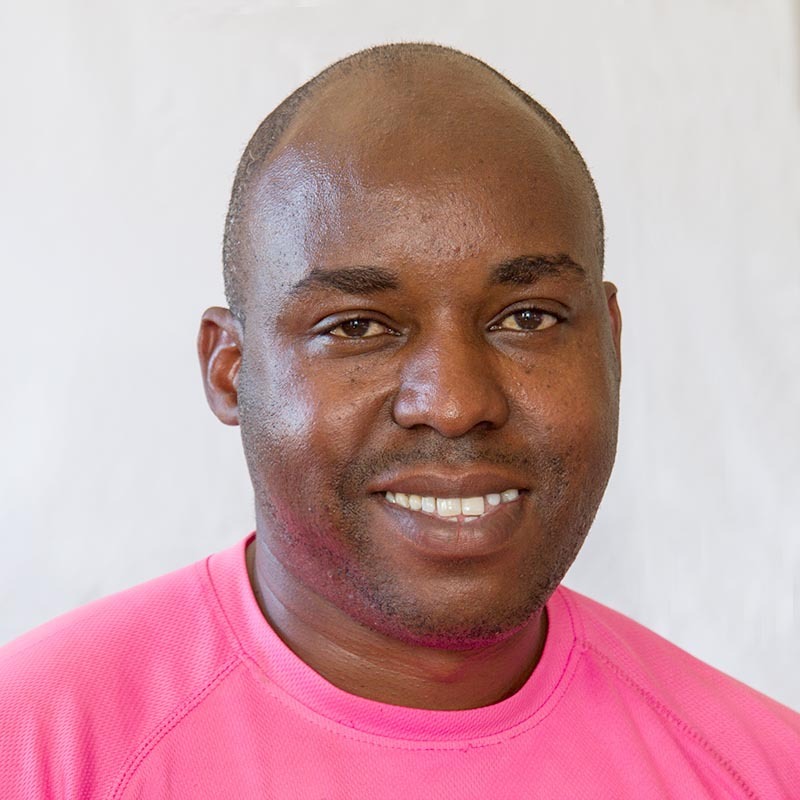 Edward trained as a professional nurse in Zimbabwe and moved to South Africa in 2007. He did private nursing for a number of years and joined PlettAid in 2014. Ed is currently doing the short course in palliative care through the Hospice Palliative Care Association of SA. Ed’s entire family, wife Carly, two sons and brand new baby daughter are part of the PlettAid team and they assist in a voluntary capacity at local street collections, selling donated goods and doing health and wellness outreaches. Carol is an enrolled nurse who has worked in public health sector in Bitou for the last 30 years – she knows everybody in Plett! 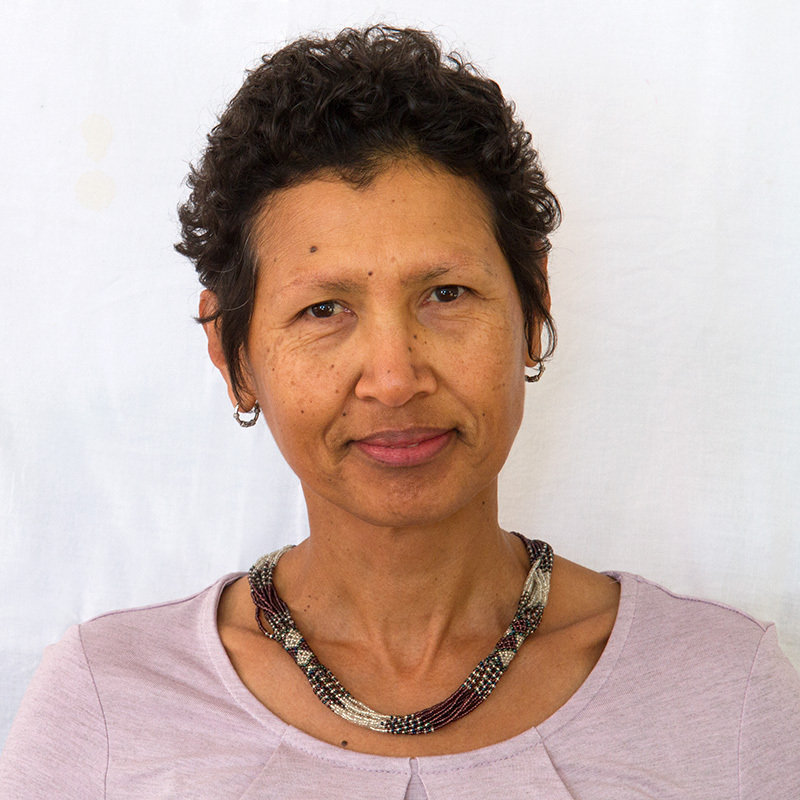 Carol has extensive knowledge on the management of HIV and TB and worked in a dedicated HIV/TB programme for 7 years before joining Hospice Plett. Carol recently completed the short course in palliative care through the Hospice Palliative Care Association of SA. Marie is a home-based carer who has faithfully served the Crags community, at PlettAid, for the past 12 years. As the most senior of the home based carers and with her pragmatic nature of effortlessly dealing with whatever challenge her patients are faced with , Marie is looked up to by the other carers as their leader. Marie is also a trained social auxiliary worker and uses those skills to holistically care for her patients. Marie knows her community back to front and is the person everybody runs to first when there is a health care need, and she is always ready to help. Marie doubles as the other of the 2 PlettAid clowns…. Jackie is a home-based carer who has faithfully served the New Horizons community, at PlettAid, for the past 10 years. Jackie has an excellent rapport with her patients and is the “go-to person” for the New-Horizons community when anybody has a health related question. She always goes the extra mile, serving others selflessly and a superstar when it comes to wound care! Jacky also doubles as one of PlettAid’s 2 resident clowns…. 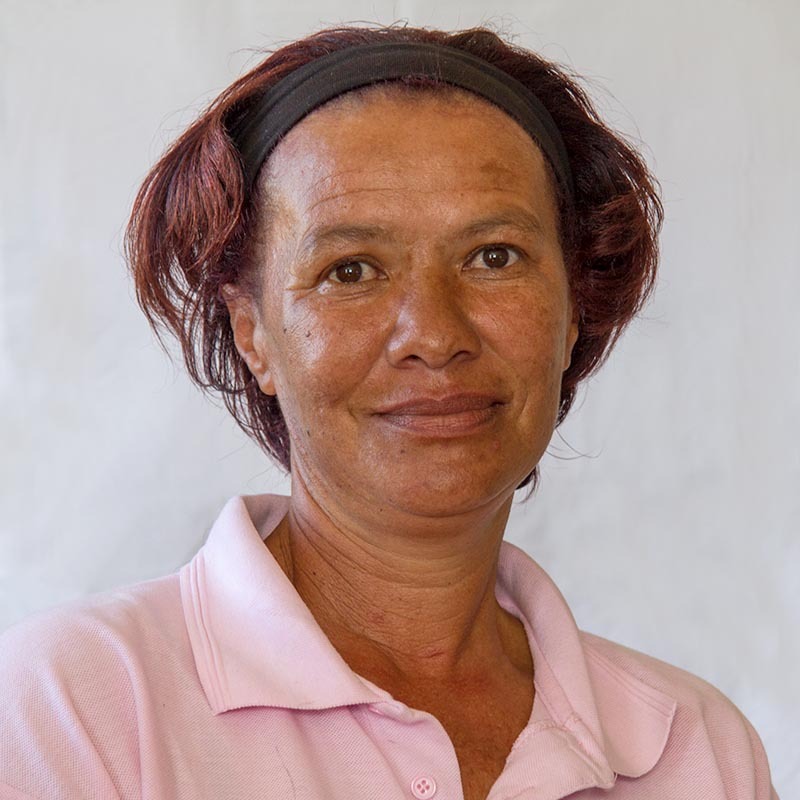 Anthea is a home-based carer who has faithfully served the Kranshoek community, at PlettAid, for the past 10 years. Quiet and unassuming, Anthea knows her community in Kranshoek back to front. 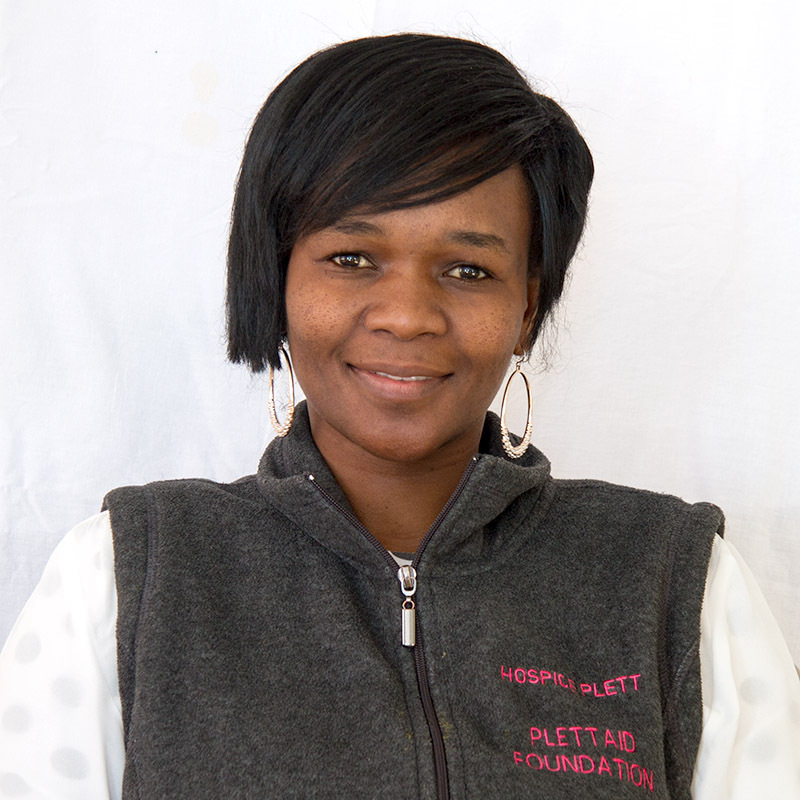 She has brought several community members to PlettAid with the instruction: “please take a look, there is something wrong”, and inevitably the patient needed some medical assistance. 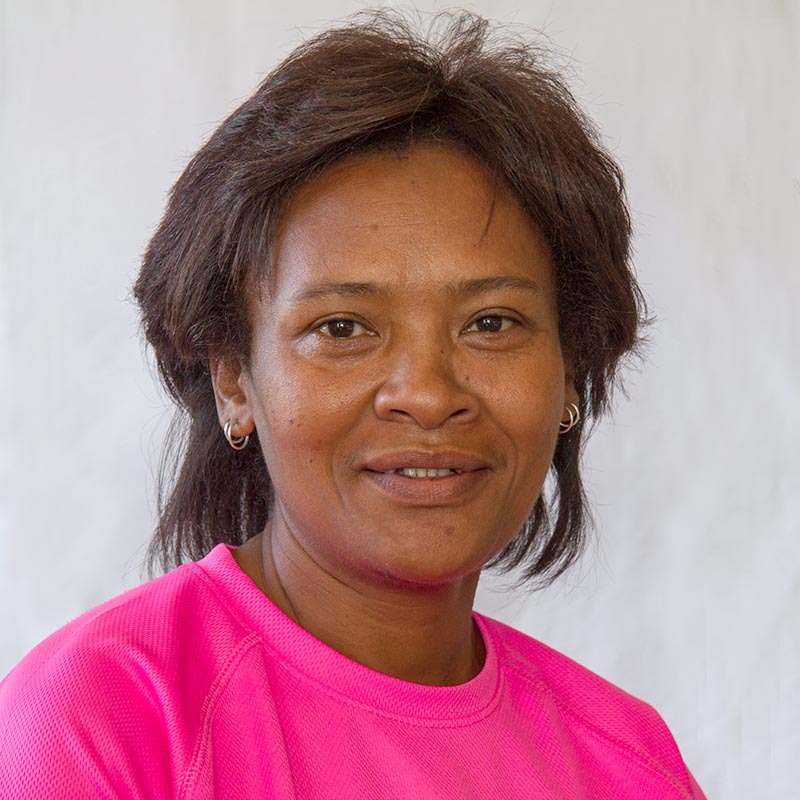 Anthea is known for her dogged persistence in getting patients to the appropriate care and is often seen pushing a patient in a wheelchairs to the clinic when there is no other means of transport. 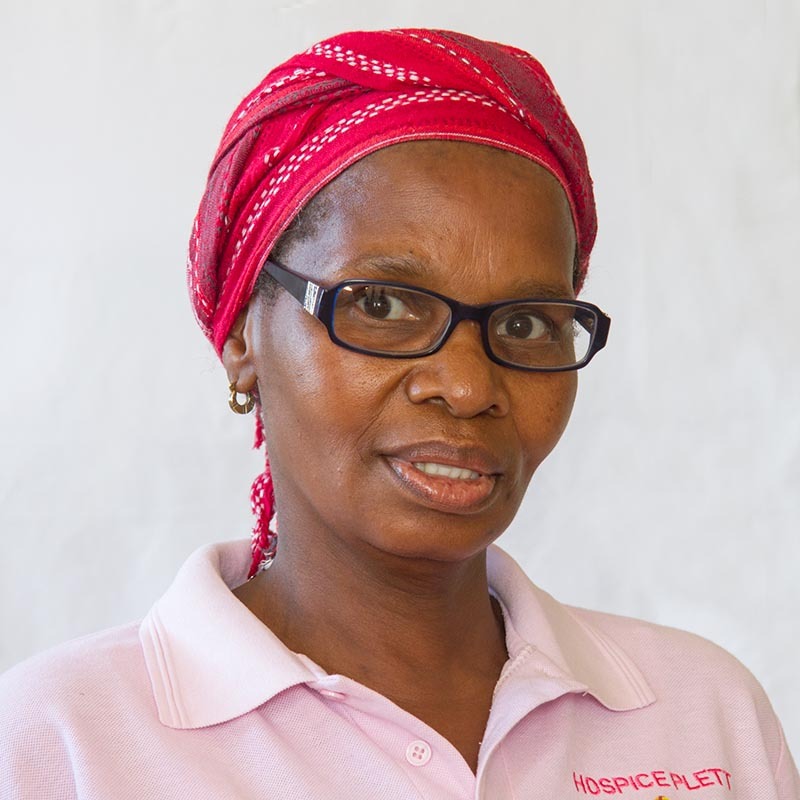 Sandra is a home-based carer who has faithfully served the Kwanokuthula community, at PlettAid, for the past 4 years. 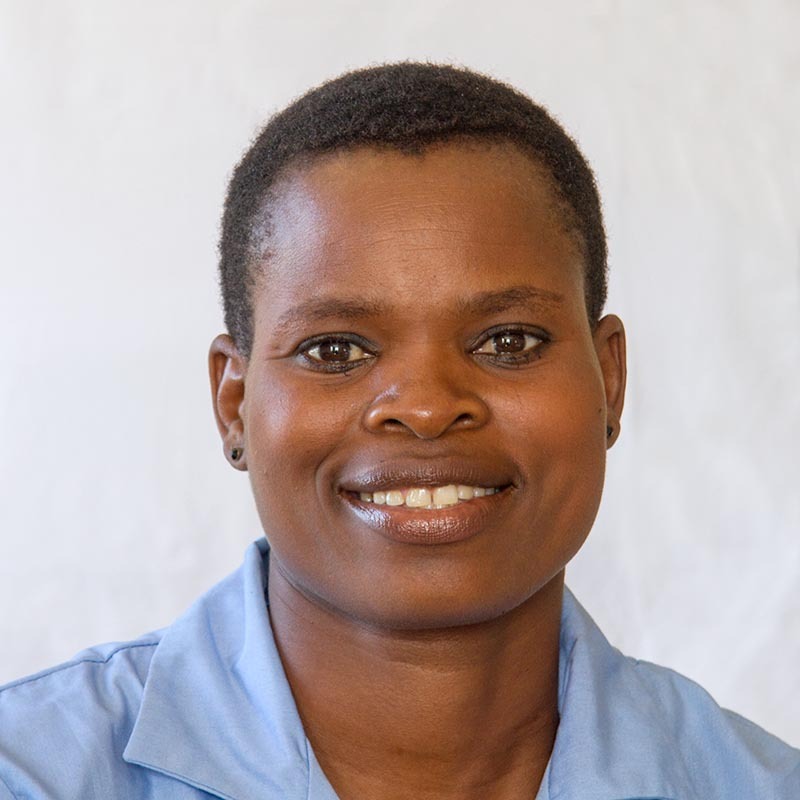 Sandra, who is originally from Zimbabwe, moved to SA 7 years ago, learned to speak isiXhosa fluently and with her bright smile and gentle nature, connects with her patients in a very special way. The vastness of the Kwanokuthula township is no problem for Sandra who manages to find patients referred to PlettAid, with incorrect address details, in no time at all. Clara is a home-based carer who has faithfully served the at PlettAid, for the past 4 years. 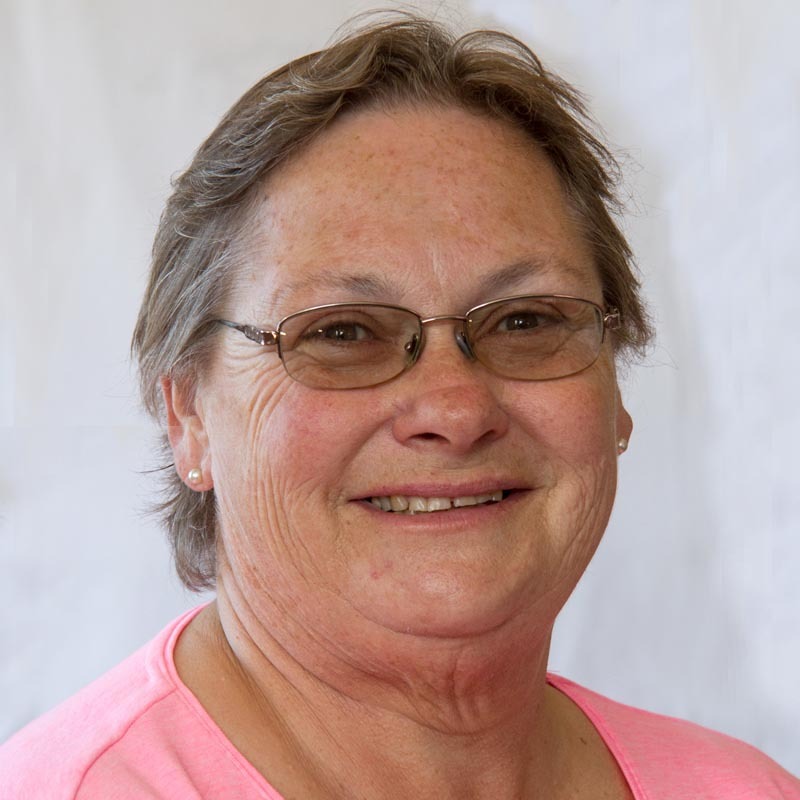 Being the only home-based carer with a drivers license, Clara mostly serves the patients in the outlying areas like Harkerville and Wittedrift. She is the chief of the patient transport service and is sorely missed currently, having just had her firstborn – Jeremiah! As the youngest member of staff, Clara is often the voice of reason when the older generation gets despondent about the behaviour of patients’ teenage children. 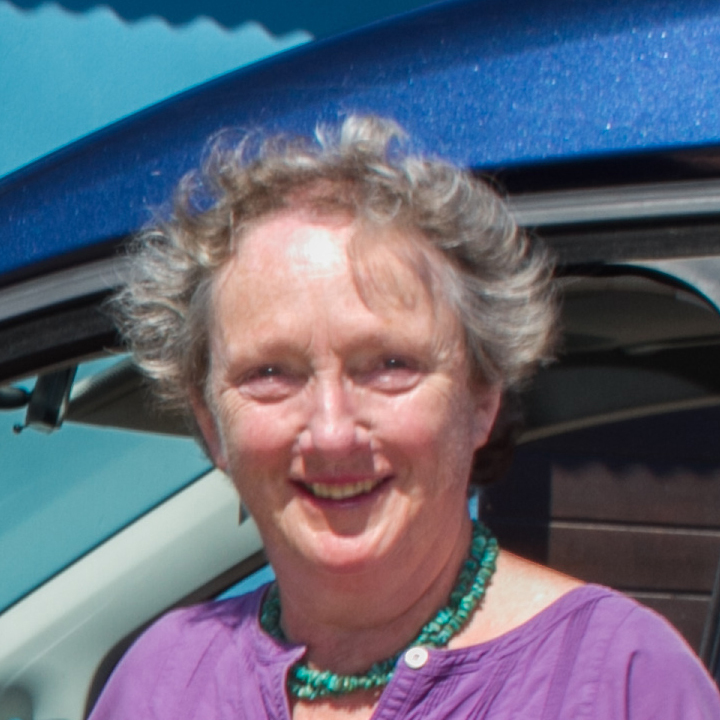 Zenzall joined PlettAid as a home-based carer in 2014 and is currently wearing 2 hats in the organisation – assisting Jackie in caring for the large number of patients in New Horizons and being responsible for the capturing of raw data collected by all the health care staff, on the data management system. Having grown up in Plett, Zenzall knows just about everybody in Plett. He is an active member of the local SANTA branch and is passionate about community empowerment through health promotion and illness prevention. Danray is a HAST (HIV/AIDS/STI/TB) counselor with several years experience in health promotion and illness prevention programmes. 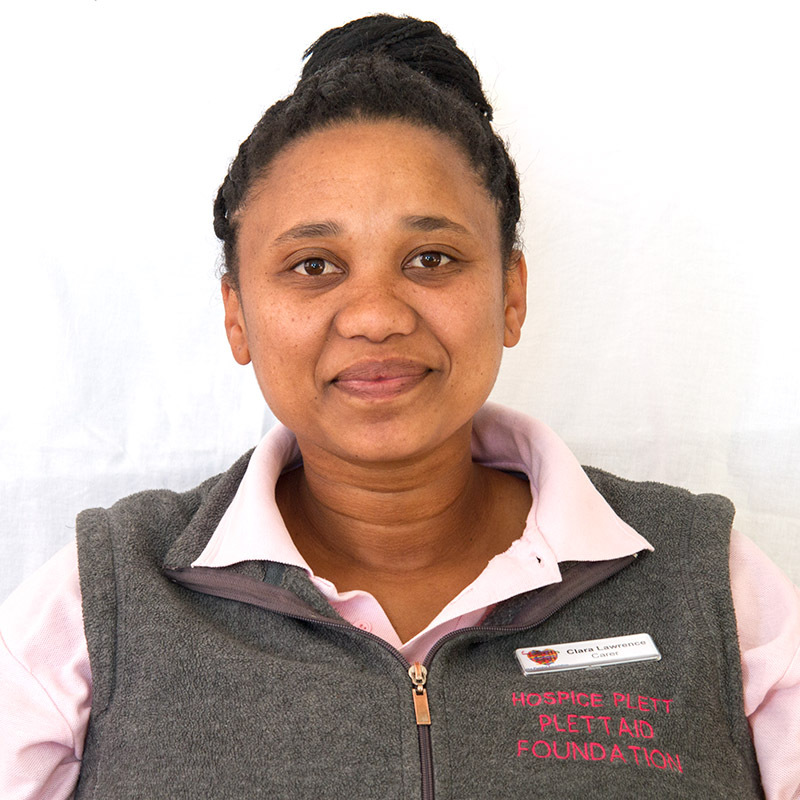 Danray joined PlettAid in 2015 as part of the wellness team and has proven herself to be capable, compassionate and dedicated to the well-being of the Bitou community.Her deeply spiritual outlook on life, makes her a favourite confidant of staff members facing difficult issues. Nozi is a HAST (HIV/AIDS/STI/TB) counselor with several years experience in health promotion and illness prevention programmes. 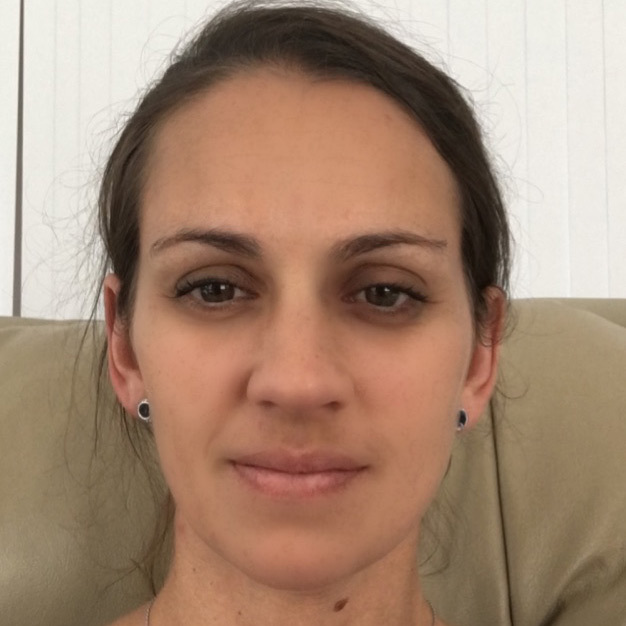 She joined PlettAid in 2015 as a member of the wellness team and has proven herself to be a compassionate and discreet counselor, dedicated to the well-being of the Bitou community. 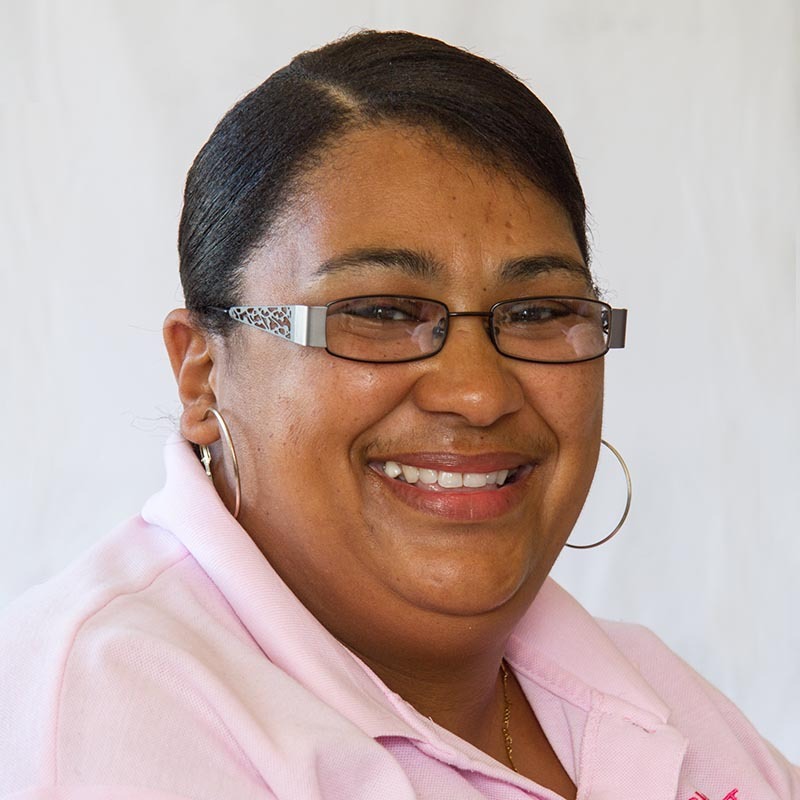 Nozi is a fixture at the Plett town taxi rank where she offers all the services of the wellness programme from her little gazebo and we had calls from community members asking: ” where is the mama who checks our blood” when she took some well deserved vacation time! Delsie has been appointed as the organisation’s first professional Social Worker. She completed her senior social work degree at Nelson Mandela University in Port Elizabeth in 2016. While at university she took on leadership positions with student counselling as a peer helper and also ran the “how to buddy” programme at the university for first year students. 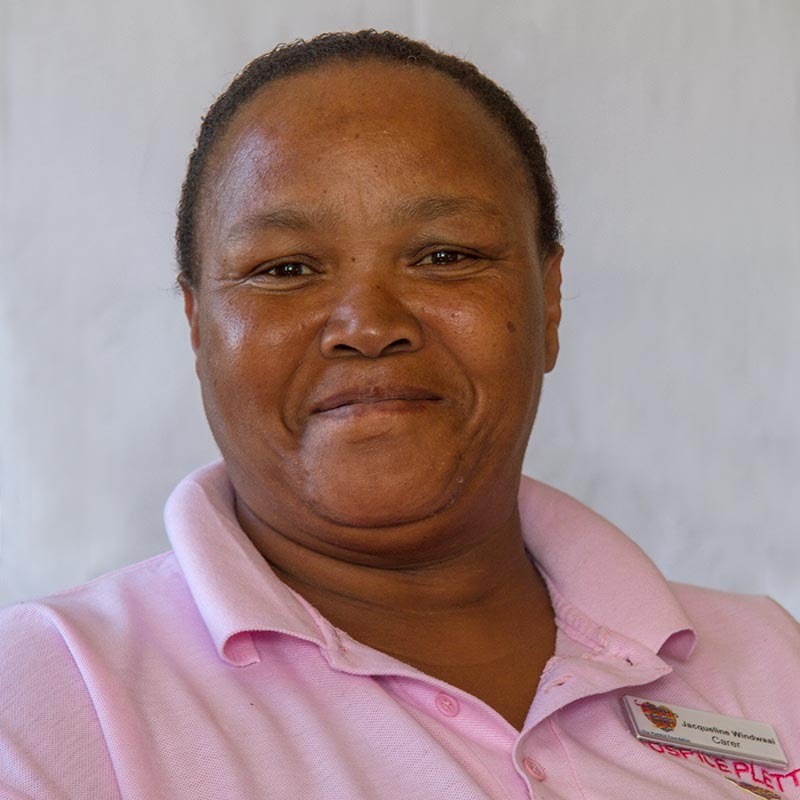 She completed her social auxiliary work training at the Huguenot College in 2010 after which she worked as a social auxiliary worker at Family Restoration Services in Port Elizabeth. Prior to that she worked as a community developer and programme coordinator at Child Welfare in Port Alfred for 3 years. Delsie completed the Introduction to Palliative Care course as well as the Raising Children Positively course. Her main role is to work intensively with patients who are dealing with life-threatening illnesses and their families through therapeutic interventions. Debbie has several years’ experience in administration, stakeholder engagement and events management. She helped run a centre for abused women and also worked as a journalist reporting on murder trials. She cares deeply about the vulnerable and abused in our society and hopes that through her expertise she can make a difference in the lives of the people the organisation serves. Sharon has worked as a volunteer since 2015 as Receptionist and Data Capturer. She has been the helpful voice over the phone and the friendly smile welcoming visitors and will now continue this in a permanent full-time position. Sharon is the ‘go-to-person’ in the organisation and knows where everyone is and where everything is stored. Her gentle personality and loyalty is widely appreciated by all who have met her. Hillary Matthews graduated from Wits University and taught English in SA and abroad for 20 years. 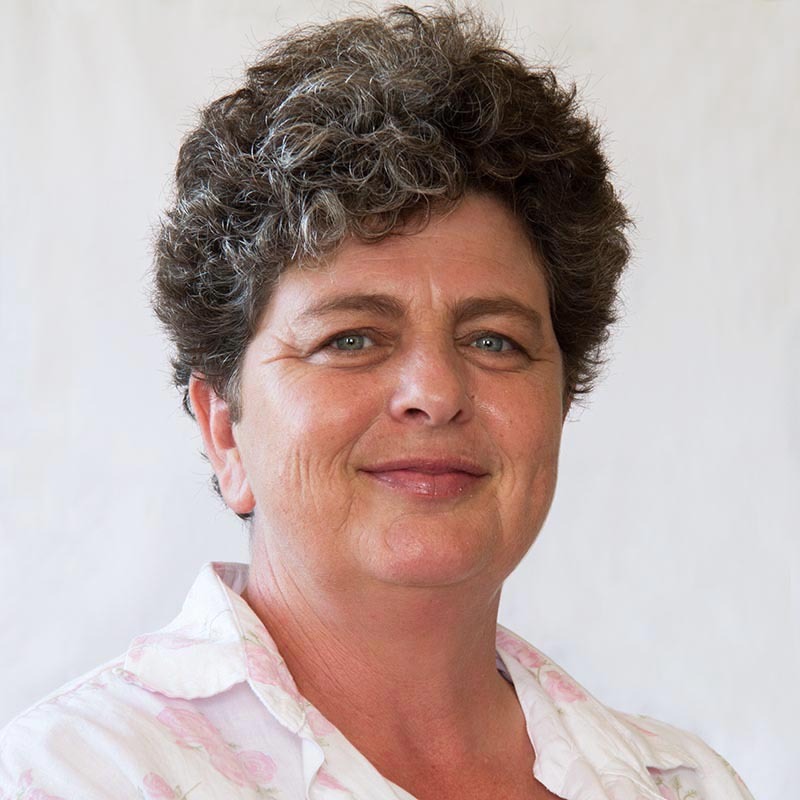 She then moved into Reconstruction and Development as the first manager of the Nedcor Development Fund after which she and her husband David “retired” to Plett in 2003. Not one to be idle, and having a passion for quality education, Hilary managed the Bitou 10 Foundation for a number of years, assisting the educators of 10 schools in the Bitou region to hone their teaching skills. Hilary joined the Board of Trustees and was elected chairman in 2014 and her extensive knowledge of the principles of sustainable development practice in the NPO and civil society sector, with especial concern for the practice of good governance based on the key values of leadership, accountability, meticulous fiscal oversight, inclusivity and transparency, has proved to be invaluable to PlettAid. 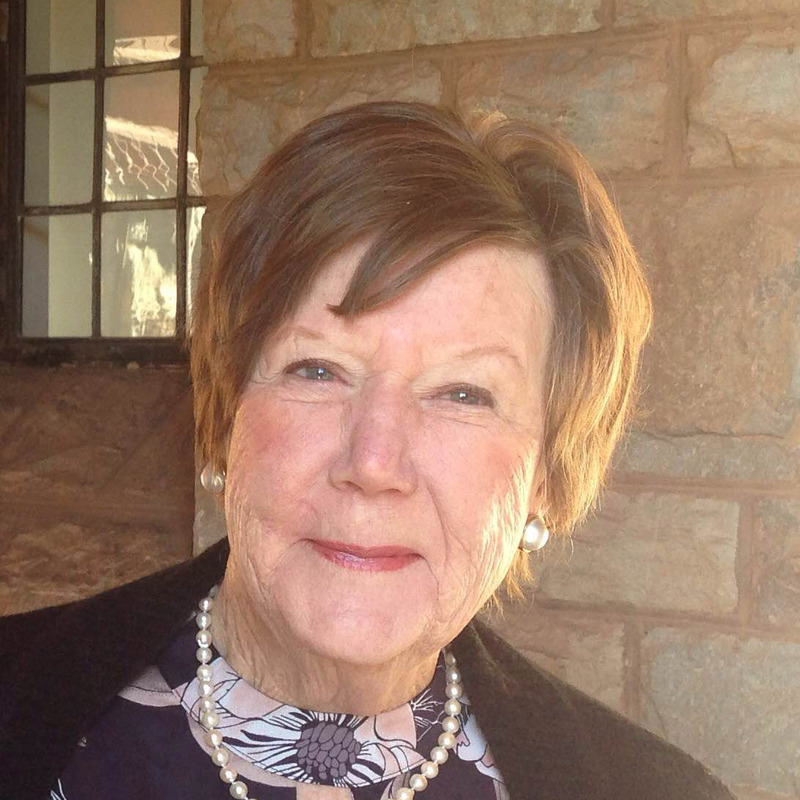 Lady Conyngham joined the Board in 2014 and is the Vice Chairman of the Board. She is also a most successful local fundraiser and through the combination of her fine arts patronage, support of musicians countrywide and her energetic involvement in environmental issues and health and welfare issues in Bitou, Annabelle is widely revered as the go-to person when fundraising events need organising in Bitou. Born and educated in South Africa, Annabelle attended finishing school in Florence where she obtained her A level certificates in History of Art and Italian. Annabelle joined Christie’s Fine Art Auctioneers in London in 1972 and became the first woman auctioneer in the firms history. Having assisted with auctions all over the world and opening three Christie’s representative offices in South Africa, she is currently an independent consultant for Christie’s. Annabelle married the 7th Marquess Conyngham in 1987 and went to live in the Isle of Man where she was chairman of the Council of the Most Venerable Order of St John of Jerusalem, on the Island and also sat on the Ladies Guild of the St John Opthalmic Hospital in Jerusalem. For her phenomenal contribution Annabelle has the privilege of having been invested as a Dame of the order of St John. 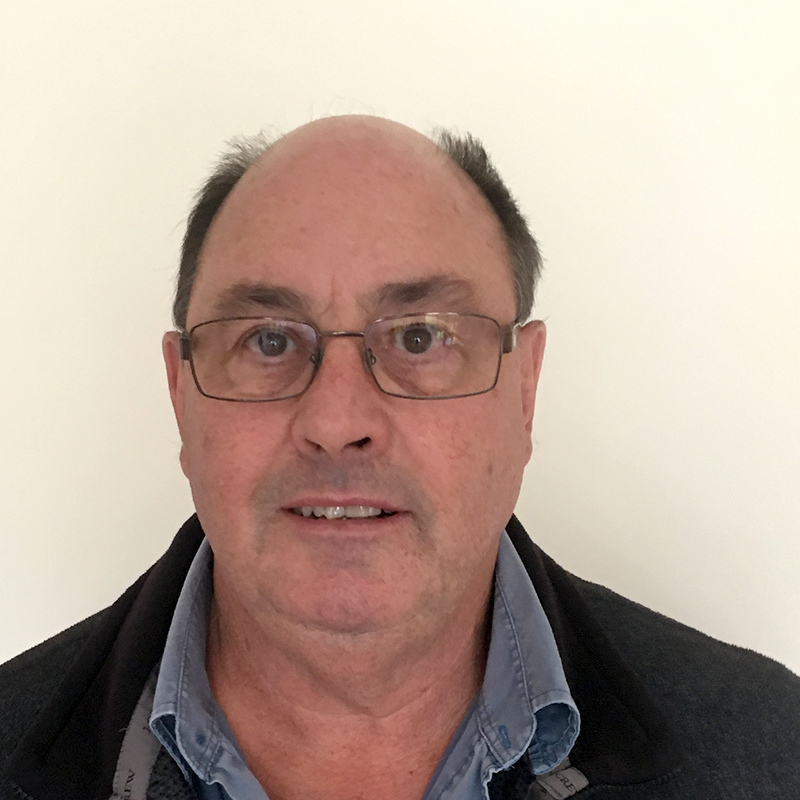 Bruce Ward-Smith is the treasurer of PlettAid and joined the board in 2015. Bruce and his wife retired to Plett in 2014 after a long career in finance and administration with a large company in the steel industry where he served as the financial director for more than 20 years. These skills made Bruce an ideal fit for a growing organisation that needed very tight fiscal controls. Bruce has been a strong contributor to PlettAid’s financial sustainability and strengthening strategy over the last two years. Bruce is an avid birder and wildlife photographer and has done many of the photographs on this website – so much for wildlife! 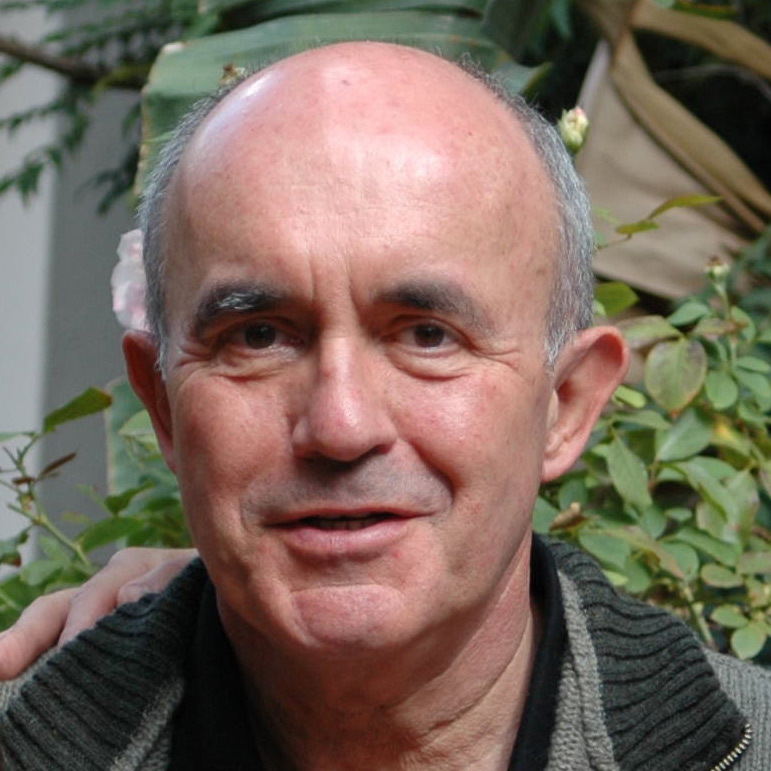 Dr Giovanni Coci, is a healthcare practitioner, specialising as a physician, in Plettenberg Bay since 1978. Dr Coci joined the Board of trustees in 2015 and serves as the link between the private health care practitioners and Hospice Plett. As a specialist physician, Dr Coci mentors the medical officers of the Department of Health primary health care clinics and hospital. Giovanni and his wife Enzina are both very active members of the Bitou community. 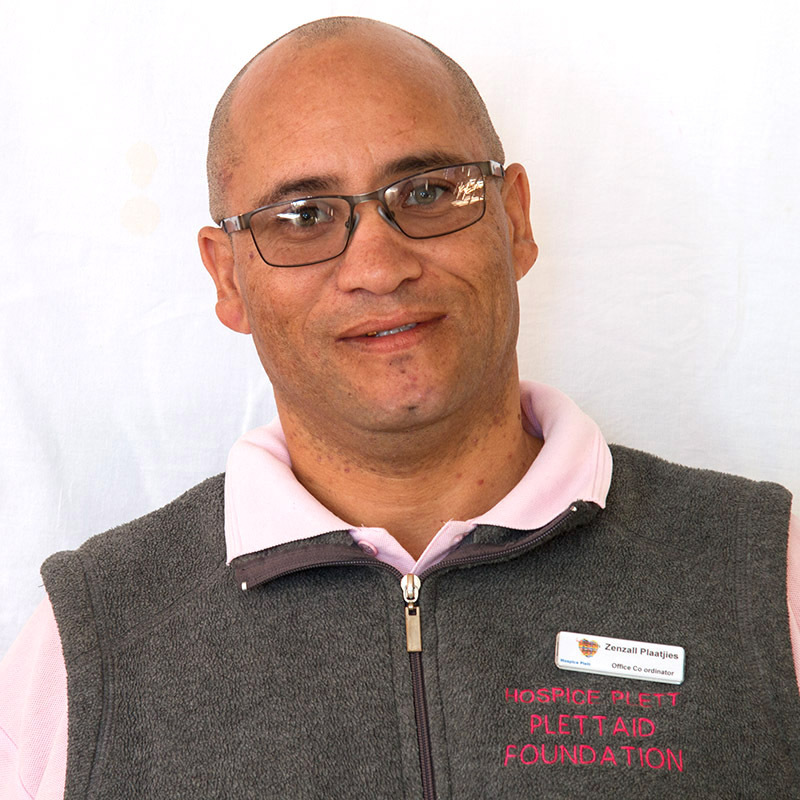 Dr Anel Scholtz, known as Docci to the Bitou community and Hospice Plett staff, is a medical officer managing the HIV, TB and chronic illness departments in the Department of Health primary health care clinics in Bitou. Dr Scholtz joined the Board of trustees in 2015 and serve as the direct link between the Bitou primary health care clinics and hospice. She is readily available to the Hospice staff to consult regarding the management of difficult symptoms and pain experienced by patients. Anel and her family has formed part of the Bitou community for generations and her knowledge of the community and resources in the community is priceless.